How Painting Can Heal Forgotten Memories – Napo B "Live"
Like in most shape shifting stories, we begin in the shadow of death not necessarily your own but death’s door as it opens to gobble up the escaping soul. In nineteen eighty four while living adjacent to a Native American burial ground to the northern Ontario, I painted into existence a long forgotten moment. I was spending the winter there after leaving Toronto and my security guard job at the Royal Ontario Museum. I was preparing to move to New York City, My then wife Patty and I had figured we could shift our mindset and prepare for a long and prosperous life in New York by first shaking off Toronto and aligning with NYC. I spent that winter in a cabin buried under six feet of snow, snowshoeing, reading every book I had ever bought that I hadn’t read and then some, loving, dreaming, baking, painting. The most enduring works of that period and one of few to survive was a painting of a fleshy pink rabbit mid jump. I have left out one detail of the painting, the rabbit is jumping over what appears to be a red spike, and for me I always imagined the rabbit was balanced as if floating, suspended in time over the red spike. Finally we moved to NYC and the painting was shown at the Bond Gallery in the Bowery. I was amazed it took me so long to see what was in plain sight, a memory from childhood and a forgotten traumatic day, it all came back to me my rabbit, my first childhood pet. A lean white rabbit with bright pink eyes that I got for Easter when I was seven years old and I lived in Ottawa. I kept my rabbit in the basement which was unfinished, really unfinished, it had an earthen floor and so it made a perfect place for the rabbit to hang out. During the basement renovations my rabbit was sliced open while jumping over a large spike in a piece of timber. That was my first experience with death, I remember sitting in the backyard, balling my eyes out for most of an afternoon til my mom suggested we maybe bury the rabbit and have a funeral. So we got a shoe box and the rest is like most kids burying household pet’s funerals. This was an Easter rabbit, a fertility rabbit, a signal spring was arriving, and the rabbit had to be resurrected, it was Easter after. 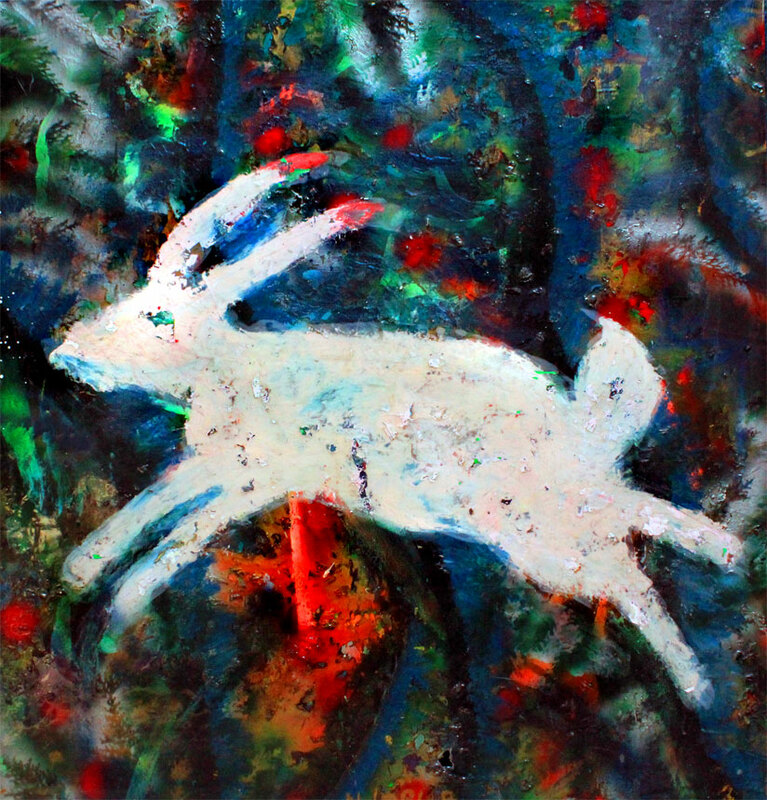 Once I realized where this rabbit image had come from I repainted it many times, suspended. A rabbit talisman floating between life and death. 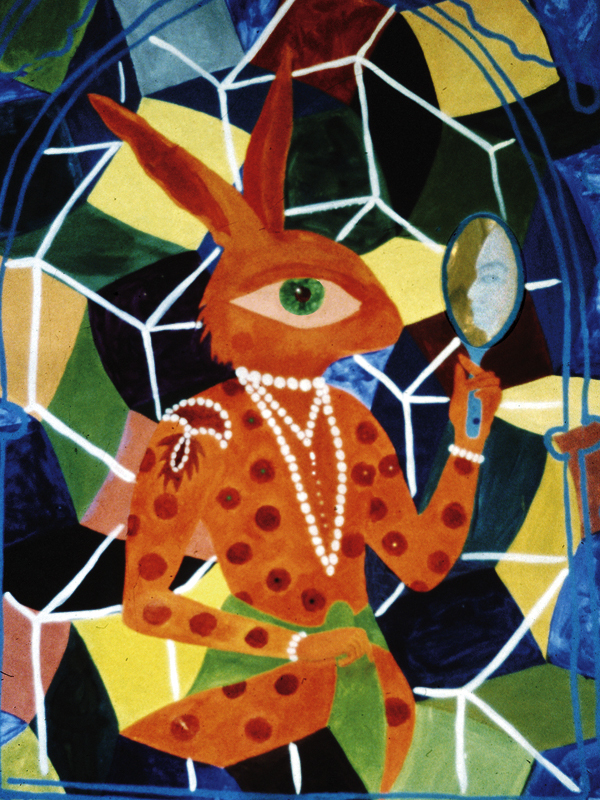 I still have that painting with me but the best part of the rabbit painting is that over time I transmuted the rabbit, shape shifting it into multiple expressions of a rabbit figure alive, prosperous and contented in the world.